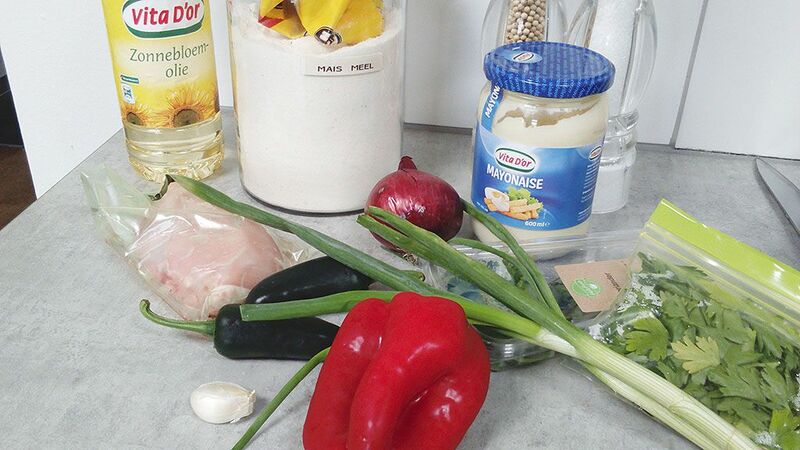 Start with the filling, the first step is BOILING the chicken fillet in water for about 15 minutes. When the chicken is fully cooked, you have to let it cool off completely. 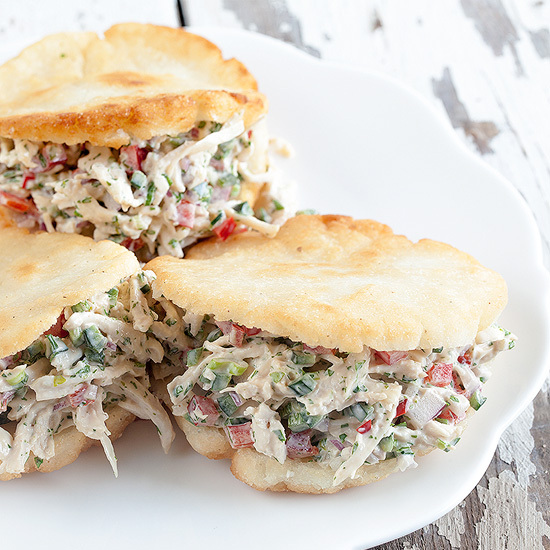 Meanwhile you can cut the other ingredients and make the arepas dough. Finely CUT the jalapeño (with or without the seeds), red bell pepper (without seeds), red onion and garlic clove. Finely CHOP the parsley and coriander leaves. COMBINE lukewarm water and salt until the salt has dissolved. MIX in the flour, cup by cup, to avoid it from creating lumps. The dough is ready when it’s soft, but firm without cracks. Set aside for a few minutes and then knead in two tablespoons of oil. DIVIDE the dough into 8 equal parts and form small balls with you hands. PRESS it downwards to create a round and flat dough. TEAR the chicken in small pieces and mix it with the chopped jalapeño, bell pepper, onion, garlic, parsley and coriander. MIX in two tablespoons of mayonnaise and season the filling with pepper and salt. HEAT 2 tablespoons of sunflower oil in the large skillet. 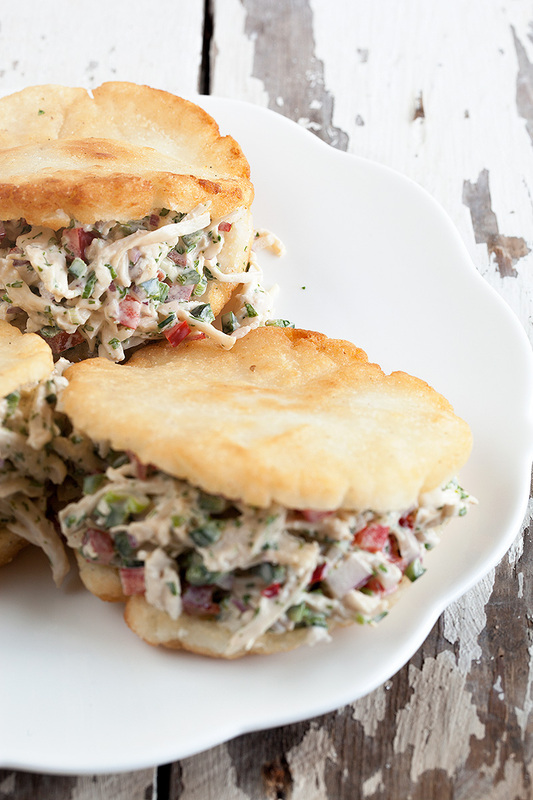 PLACE the arepas in the skillet and cook 4 minutes per side, or until golden brown. You can place them in the oven for a few minutes, if you think they aren’t cooked enough on the inside. We skipped this step, so it’s optional. 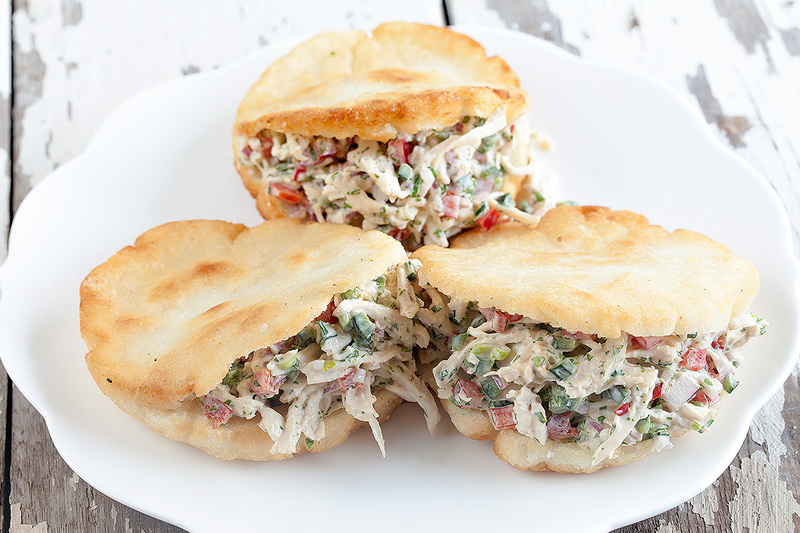 SPLIT each arepas in half and fill it with the chicken filling. Enjoy! Could you tell me if this corn flour is the same or different from the corn flour (masa) used to make tamales and pupusas? I have a bag of Maseca (instant corn flour mix) and would like to know if I can use that. To be honest, we’re unfamiliar with all those kinds of flour. For example, making tamales for the first time is still on our to do list. But we did some research, and we think it’s a different type of corn flour. On different pages we found using Google, they say both flour types have different processes. 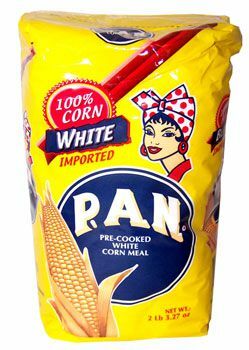 for Arepas you use “harina P.A.N.” pre-cooked corn flour. popular with Portuguese and Caribbean people… also Colombian and Venezuelan of course.